Here are with Uncharted Part 5! If you remember last time, I talked about and showed my gameplay video of Sam reuniting with his brother and explaining to him how he got out of the prison in Panama. He also explained to Nathan how he’s in serious trouble. We got to see how thanks to a drug lord, he was able to get out. It was quite an action packed chapter in the game and it seemed like Sam might’ve gotten killed in that big prison escape. We also see that Hector Alcazar threatens Sam and gives him only 3 months to find the very valuable treasure! Sam convinces Nathan to help him although Nathan was reluctant at first. So now I will continue where I last left off which was at a house/estate where an auction is taking place that includes the sale of a different crucifix from the one that Nathan found years ago at the prison. This auction is actually taking place in Italy. 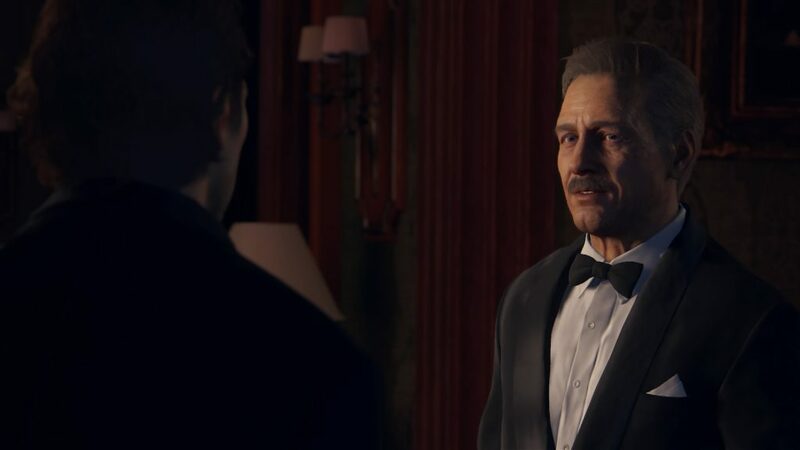 As the cut scenes advance and Sam and Nathan are talking to each other, you learn that Sully is also with them, but he’s already inside the auction and has to sneak Nathan and Sam inside. They’re waiting for the signal, but as Sam and Nathan talk, you can tell that Sam doesn’t entirely trust Sully even though we all know he’s been a staple of the series since the beginning. As they continue to talk, Nathan notices light being flashed from a window at the large estate. Nathan tells Sam to look and says that Sully did come through like he usually does. Now the fun part begins as they have to make their way to that particular window. They make their way there going through some rocky areas and making small talk. They come up to a bridge, but they see a beam underneath it where a rope can be thrown. Now this what I like about the game as they give you hints about what to do next. As Nathan gets a rope with a hook out and starts swinging it, the game tells you to push the L1 button to throw it at the beam. The first time I aim too low and miss it and Sam makes a comment about it. I manage to connect to the beam the second time around and then I jump, however I should’ve really paid attention to where I was going before I made that jump as I released from the rope too quickly and fell to my death. You can hear my reaction to it as well, haha. I give another go, but once again I don’t exactly see where to go and fall to my death a second time. Alright, it is time to get serious! The third time’s the charm! I try it again paying much more attention to what I have to do as I swing around and this time release at the right time and grab a hold of a ledge. We both are on the ledge of that rock wall and continue on. There’s more climbing and another instance of using rope, but I don’t want to talk more about that here. We finally make it to the window and get out of our jumpsuits to where we are now showing our tuxedoes for this auction. As soon as we get in the window we are greeted by Sully. I must say it is nice to see him again in this series. Once they are done exchanging pleasantries, Sully wants to show them something. They head out of the room and look down on to the main auction floor and see that the cross they’re after is already out ready to be auctioned off. Sully mentions that someone changed the order of the items to be auctioned off. It seems someone else really wants that cross as well. So now they discuss how they’re going to get that cross especially now that it’s out where hundreds of people can see. Nathan is trying to come up with some ideas to do just that without getting caught of course. Sam reminds them to think back to when they were in prison because if you wanted something there, you waited until the lights were out so they all agree to shut off the power to get the cross, but of course a place like that has a backup generator. Nathan mentions that shutting off the main power would get them a few seconds to take the cross which means they would have to be right next to it when the lights go out, but of course the guards won’t let anyone get that close to any of the items being auctioned off. It is at this moment when all 3 are discussing this, a waitress comes up and offers them some food. Nathan and Sully say no, but Sam takes a small piece off of the tray. Nathan mentions to Sam to focus, but Sam mentions that a waiter wouldn’t get noticed if they were that close to the auction item. They decide to head to the cellar as that is where they believe the circuit breakers are to shut off the power. Nathan wants Sully to stay up stairs to keep an eye on things. As they eventually make their way to the door that goes to the cellar, they noticed it’s locked and Sully says that’s odd since it was unlocked not long ago. There’s no way to pick the lock as it is magnetic. Suddenly though the door opens and a waiter comes through. They noticed he has one of those cards you swipe against the lock to unlock the door. They also notice that the waiter puts that card in the his back left pocket and Nathan says it’ll be easy to swipe it, but it really isn’t as easy as he though. Sam comes in to distract the waiter by talking to him and Nathan sees the opportunity and finally takes the card from the waiter without him noticing. Sam and Nathan make their way back to the door where Sully is waiting and they unlock it. Before Sam and Nathan head down, all three of them put in ear pieces to keep in communication with each other. As Sam and Nathan head down, Sully goes back to the auction floor and starts looking around when all of a sudden a woman comes up behind him and says “Hand in the air”. Sully turns around and recognizes who the woman is. Her name is Nadine and Victor says to her how good it is to see her again. I get the feeling though she’s not someone who is going to play nice in this game. When she eventually walks away, Sully communicates to Nathan that Nadine is here. Nathan thinks for a moment and then realizes she was part of an army for hire in the past. Her full name is Nadine Ross. Nathan and Sam are in the basement and so they go to search for the circuit breakers. They eventually come to a part that they didn’t recognize in the blue prints of the place and they can’t go through it because it is locked. So now they have to find another way around which they eventually do when they make their way to where all the wine and drinks are. Now there’s a lot more I can keep going on about, but you can see the rest of it in the video. 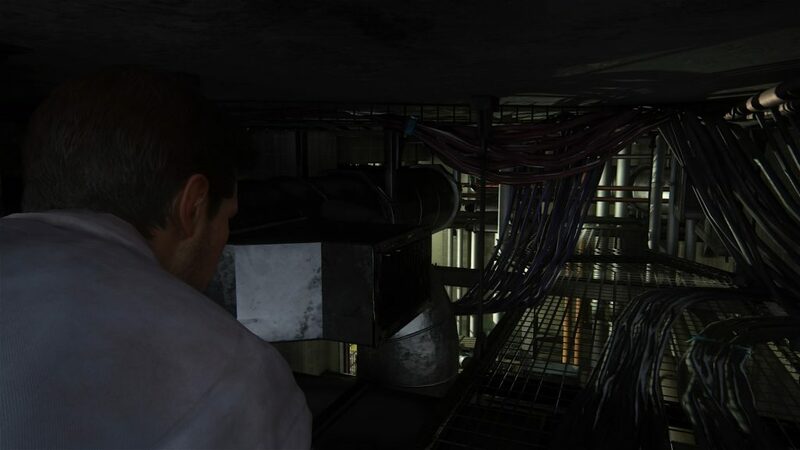 To kind of summarize the rest, Nathan and Sam have to go through a vent to get to the other side of the locked area they couldn’t access, Sully comes into contact with another person who happens to be the guy who was originally with Nathan and Sam at the prison 15 years ago. After making small talk, he threatens Sully about trying to win the auction for that cross. Sully mentions to Nathan that this guy is here and he’s going after that cross. He owns a very big business his parents once had so he has the money to buy that cross. Sam knocks out a waiter and puts on his clothes and makes his way back to the auction floor and gets as close as he can to the cross. They mention to Nathan to hurry up as fast as possible as the auction has started and Nathan tells Sully to start bidding to buy some time. They’re going to steal it anywhere so there’s no reason to worry about paying for it. Nathan is in a control room in another part of the large estate and has to break a lock to get into where needs to in order shut off the main power. As soon as that business owner seems like he is going to win the auction, the power goes out and a short time later, the back up lights come on, but the cross is gone. The business owner is furious and looks around and just barely notices someone going through a door somewhere. He suspects that’s the thief and runs to the door, but guards are there and tell him to back away as they have some big guns. Nathan get’s out of the control room and Sully tells Nathan to make it to the get away area. This is where the next chapter starts and I end part 5. I do have to make an apology though as this video is quite long, 49 minutes to be exact and you’ll hear other noises in the video that is coming from me. You’ll hear what says like a tapping noise, but that is actually me chewing on jellybeans which I’m getting out of a bag that you can also hear rustling in the video. It doesn’t happen throughout the whole thing, but at points it does. In the next part I promise to have my microphone off while eating anything. I hope you enjoyed Uncharted 4 Part 5 and want you to tune into the next part to see how they’ll all get away with the cross. As always feel free to post comments! Thanks Brian for writing up the story of Uncharted 4 for us. I haven’t purchased any games for my PS4 for a while now and it’s been collecting dust. I should probably pick this game up; I played Uncharted 2 way back and it was really a blast. I’m going to check out your other Uncharted 4 articles as well as some more gameplay footage. Does this installment have good ratings? Hi there Paul! Glad you liked my post regarding Uncharted 4. You should definitely get back into the series as Uncharted 4 is amazing has been getting excellent reviews. The graphics are jaw dropping and probably the best I’ve seen on this generation of consoles. Definitely worth a pick up!